PNF is a grassroots custom shoe donation project. Madison Steiner and her team of guest artists hand paint and donate canvas shoes for children battling cancer, serious illness, and lifelong disabilities. Shortly after meeting Clinton, he received his pair of PNF’s and oh how he loved those shoes! I remember how amazing they looked, but more vividly I remember how they made Clinton feel. Clinton’s PNF’s brought him Joy and made him smile that smile. He used descriptive words like “cool”, “colorful” and “special” to describe his shoes. You can see some snazzy photos of Clinton’s shoes here: http://www.peachsneetfeet.com/theirstory/57-clinton. Being introverted naturally lent Clinton to be a thinker and he had an amazing analytical mind. He told me all about the process of painting shoes, and how he had picked what should be on his very own. Clinton’s shoes were sponsored by Fletcher Christian, a complete stranger. We probably never thanked him appropriately, but as I wrote this post I thought about him and decided to message a note of thanks. Better late than never! This is the reply I received today “Well, no thank-you was ever needed. As odd as it may be Clinton had a very big impact in my life, and helped initiate a change for the better. But, I did it in the first place just to help bring a smile to someone who needed it” I’m telling you people – this is where the magic starts! It may seem like just a pair of painted shoes, but it’s so much more. We all knew Clinton as a cheeky 7 year old hero. Our hero, who touched the lives of complete strangers – and still is to this day. Fast forward a year full of connections and opportunities to sponsor shoes. I have experienced an immeasurable amount of joy by sponsoring and watching these kids receive their shoes. At this point, I just go online and send money to Peach and her team works their magic. In a somewhat routine email, I received notification that my last donation had sponsored some rocking PNF’s for not only a Leukemia warrior – but a Down’s Syndrome (DS) Leukemia warrior! If you are not aware – kids with DS are at an increased risk for Leukemia – but it’s a double edged sword. The very genetic mutation that lends itself to better NED rates, are the very same mutations that increase the risk of Leukemia. It’s hard to put into words exactly what happened next. Somehow through the magic of social media, Keeton’s mom, Misty and I realized that we are long lost sisters or something! 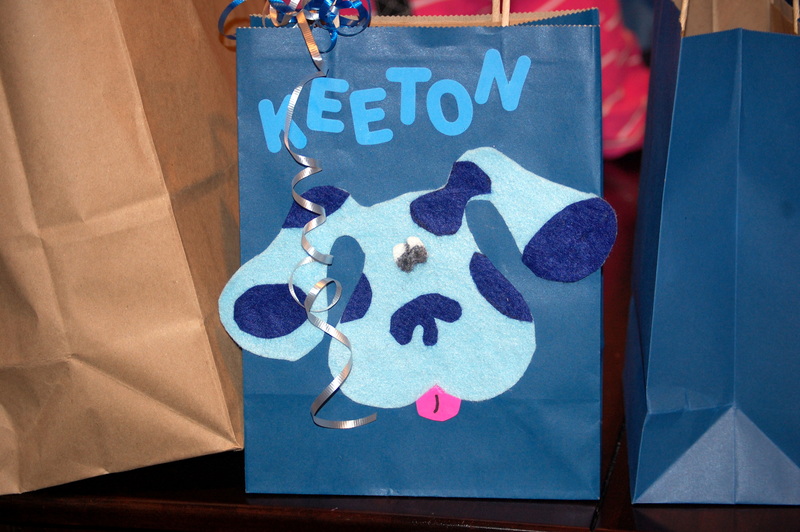 In the very short time since Keeton received his PNF’s, I learned that his parents wanted more than ever to have a 3rd birthday party for him –and just have one day of being a “normal” kid. However, going from two incomes to one while fighting childhood cancer just doesn’t save room in the family budget for birthday parties. WHAT? I could provide that! I immediately fell in love with Keeton – from a photo. I printed it out the same day I received it – and there it has stayed on my refrigerator and in my Bible – a reminder to pray for this child each day. Most mornings, Keeton is the first thing I see. Keeton loves Blue’s Clues and my heart was stolen by Keeton. So – with some help from other Clinton’s Clubbers, we planned, created, and crafted our way into creating a Blue’s Clue’s Birthday Bash to beat the band! Volunteers came together with countless hours of crafting and executing. None of our volunteers knew Keeton, nor would get the chance to meet him. At the time that I committed, I didn’t even know where he lived – but anywhere is accessible by aircraft – right? As it turns out, we only live 3 hours apart! I drove from Nashville with my son – and a car loaded full of Blue (and a cake that made it over Monteagle mountain doing – you know, the speed limit!). We had 30 minutes of set up time – never seeing the party location, but with Keeton’s local friends, we pulled off a fantastic Blue’s Clue’s themed party. It was an amazing experience, one that has changed my life for sure. 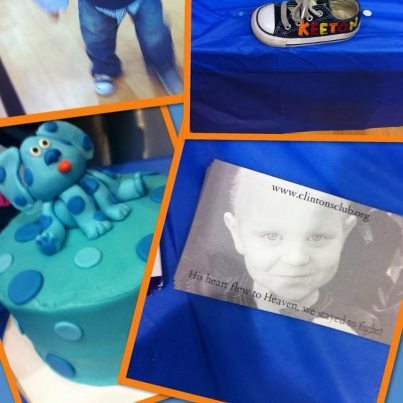 To be able to watch this little guy dance, play and eat cake with that fabulous smile – worth every minute and more. Today, Misty posted this on my facebook wall: “Lori, on days my faith is weak and doubts flood my mind… I know a greater power is there watching and waiting for the perfect time to send a special someone into your life. It’s truly amazing how a pair of shoes could change our life, but those magic shoes have touched our hearts and our life in more ways than I can count. You could’ve sponsored any child, but you fell in love and chose this precious ray of sunshine named Keeton. It was an instant love and connection for all of us with you and your family. It feels like we’ve known each other forever and we are truly blessed & honored to call you all family. God’s ultimate plan♥ Life hasn’t been easy and not having family has been even harder. I’m so thankful for having you in our family. I would be lost without the love and support from our “c” family. Thank you God for blessing us with you♥. My favorite Keeton story is yet to come, I just know it. I can not wait for the day that we celebrate his “I Love you’s” spoken to his Mom. During my short visit, Misty told me how she had the chance to take Keeton to Disney on Ice recently. He does not communicate with words, but the joy in his heart and his level of excitement was so overwhelming that each time a new character came on the ice, he turned around and hugged his Mom. I love this. This is a true representation of a PNF warrior. It really is an amazing thing. They are just a pair of shoes. Instantly family through a pair of shoes? I never set out with the intentions of being thrown into the Childhood Cancer world – but no one ever does. I have been blessed to know these families and what they give to me is far more than I could ever give back. I have loved with them, lost with them – and will fight with them to change this unequal equation of funding for a cure. It’s mind boggling really. There are too many beautiful families to mention in one post, but I can assure you one quality they all possess for sure. They spend their time living. Sometimes moment by moment, but never just waiting for death to occur. Until the last breath their child takes they fight and have hope, they raise each other up. They love like nothing I have ever seen. They celebrate the smallest of things – like band-aid drives and plastic bracelets with each other’s names on them. I have witnessed more living and more life experiences wrapped up in short lives than some who live 85+ years ever experience. It’s true, I’m a volunteer – but I get paid. BIG. As I was pulling away from the party (the first time – Misty led me to the hotel, but couldn’t keep driving home as planned. She had to pull in and get out to say good-bye one more time) little Keeton slapped his hand over his perfect little mouth and blew kisses to me. Misty was stunned. She didn’t think that Keeton really connected with others, but he did. I have a feeling there will be a lot more of those blown kisses delivered, and I can’t wait to catch them! So, yes – it’s just a pair of shoes. A magical love-filled pair of shoes. Thank-you Madison and PNF for allowing us to be part of your tribe.